Group of refugees supported by South Florida's Refugee Assistance Alliance organization. At present, The State of Florida’s refugee program is the largest in the United States, resettling more than 25,000 refugees and 2,000 asylum seekers each year. South Florida’s refugee population is predominantly made up of Cubans and Haitians. Interestingly enough, Cubans account for over 80% of arrivals per year. Due to the high numbers of migrants arriving from Latin America and the Caribbean, Florida’s diverse refugee communities from countries such as Syria, Iraq Palestine, and Ethiopia are often overlooked. Oftentimes, the resources needed by these small refugee groups are limited, due to the absence of socio-cultural understanding, and lack of services available to them in their native language. 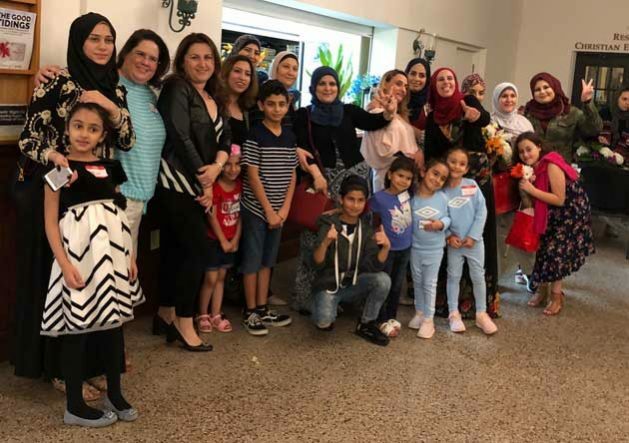 Although the Syrian refugee population in South Florida only amounts to roughly 90 people, groups such as the Refugee Assistance Alliance and Muslim Women’s Organization of South Florida are determined to help not only Syrian, but all underserved refugee communities. Undoubtedly, according to Refugee Assistance Alliance’s founder and executive director, Kristen Bloom, refugee families’ main setback comes through their lack of English. Although the refugee resettlement process offers English classes, many cannot attend due to limited transportation, lack of childcare and conflicting schedules. Furthermore, as English classes cater to predominantly Hispanic students with English-Spanish bilingual teachers, oftentimes, the families feel both culturally and linguistically isolated in the classroom and prefer to stay at home. Significantly, non-profit groups have placed a keen focus on educating the Mothers of the households with no external occupation, as they are the least likely to be exposed to the language. Refugee advocates believe by empowering the female head of the family, all the other family members will feel confident in their new surroundings. For example, an ongoing Syrian refugee gathering, “A Taste of Syria” held in Miami, empowers Syrian chefs, always women, to cook food and earn a profit from it. For many Syrian women, this is the first time they have provided for their family financially and it has granted them with a new sense of purpose. Last month, a second-generation Cuban migrant recounted the story of his father’s journey to the United States at a Taste of Syria event. His father was met with open arms in an American restaurant as a waitress proclaimed “Welcome to America” and did not charge him for his meal. The man claimed that most Floridians know what it’s like to be uprooted from the country of their birth and start all over again. He extended a warm welcome to all the refugee families present. “We want you to thrive and succeed here.” He said to the group of refugees at the dinner, just as the waitress said to his father many years ago, “Welcome to America”. Refugee support organizations across South Florida would no longer need to exist if this goal is met. However, refugee rights advocates hope that if incoming refugee numbers increase, they will always have someone to help. Unfortunately, the incoming refugee quota in the United States is at a historic low. Surprisingly, in 2018, only 11 Syrian refugees were admitted into the country. What’s more, for Fiscal Year 2019 (FY 2019) the Trump administration proposes a resettlement cap of 30,000 refugees. This figure lies in stark contrast to Obama’s cap of 110,000 refugees in FY 2017.Oftentimes, due to strict vetting processes, the quota is not even met. Many Floridians are unaware of the small yet underserved Syrian, Iraqi, Ethiopian etc. refugee communities that surround them. By advocating for refugee rights and empowering them through entrepreneurship, education and inclusion, the divisive “fear” and stigmatization shadowing refugees and migrants will eventually break down. As a global society, we must continue to include refugees in our communities, so they may become self-sufficient and contribute in the most impactful way.